A Christmas window design for tailor Douglas Hayward on Mount Street by Henny Van Nistelrooy in collaboration with Mary Ngachi-Tam. Henny's creative response to the underlying geometrical structure of Bute textiles in his 'Shelter' collection echoes the skillful use of woven fabrics by tailors and also the contemporary approach to cloth textures that is core to Hayward’s Ready to Wear designs. 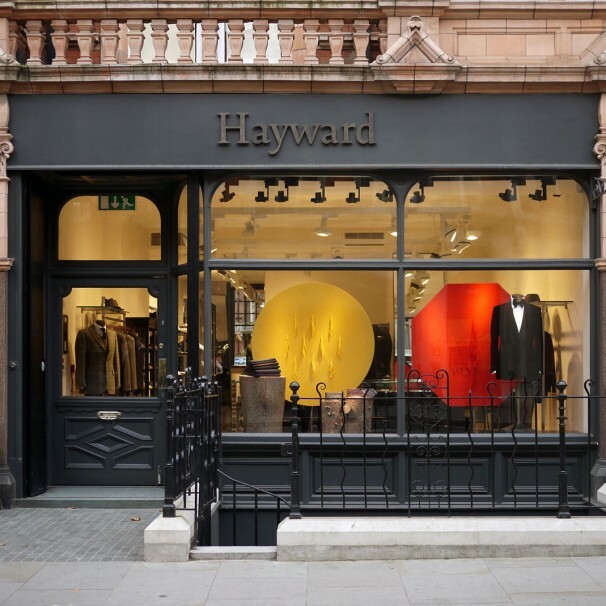 This festive statement is made by the bold geometrical screens that are combined with logs displaying items of Haywards Ready to Wear designs and an example of a bespoke dinner jacket. This rich mixture of textures make a glamourous presentation breaking with the stereotypical of the season.